ORIGINAL TRADE PAPERBACK. A chaplain serving in Earth's space fleet is trapped behind enemy lines where he struggles for both personal survival and humanity's future. The mantis cyborgs: insectlike, cruel, and determined to wipe humanity from the face of the galaxy. The Fleet is humanity's last chance: a multi-world, multi-national task force assembled to hold the line against the aliens' overwhelming technology and firepower. Enter Harrison Barlow, who like so many young men of wars past, simply wants to serve his people and partake of the grand adventure of military life. Only, Harrison is not a hot pilot, nor a crack shot with a rifle. What good is a Chaplain's Assistant in the interstellar battles which will decide the fate of all? More than he thinks. Because while the mantis insectoids are determined to eliminate the human threat to mantis supremacy, they remember the errors of their past. Is there the slightest chance that humans might have value? Especially since humans seem to have the one thing the mantes explicitly do not: an innate ability to believe in what cannot be proven nor seen God. Captured and stranded behind enemy lines, Barlow must come to grips with the fact that he is not only bargaining for his own life, but the lives of everyone he knows and loves. And so he embarks upon an improbable gambit, determined to alter the course of the entire war. Brad Torgersen is a writer who's done a lot and come up the hard way... and the depth of his writing shows it, especially in understanding the nuts and bolts of technology and the souls of those who use it." - L.E. Modesitt, Jr.
"Solid hard SF with the frisson of well thought through action. Much to enjoy " - Dr. Gregory Benford multiple Nebula award-winning creator of the Galactic Center saga. Brad R. Torgersen is the author of numerous stories, novelettes, and novellas which have appeared in the pages of Analog Science Fiction and Fact magazine, Orson Scott Card's InterGalactic Medicine Show webzine, Mike Resnick's Galaxy's Edge magazine, and beyond. He's the 2011 winner of the Analog AnLab Reader's Choice Award for best novelette, and also won a place in the 26th annual Writers and Illustrators of the Future Contest. 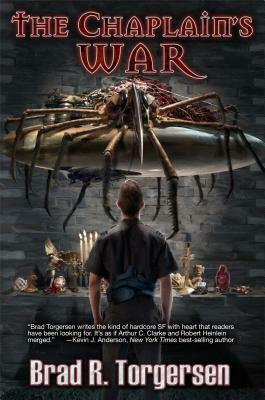 For 2012 he was the field's single triple-nominee for the Hugo, the Nebula, and the Campbell awards. A full-time healthcare computer geek, Torgersen also holds the rank of Chief Warrant Officer in the U.S. Army Reserve. He lives in Utah with his wife and daughter. The Chaplain's War is his first novel, preceded by his short fiction collections Lights in the Deep and Racers of the Night.